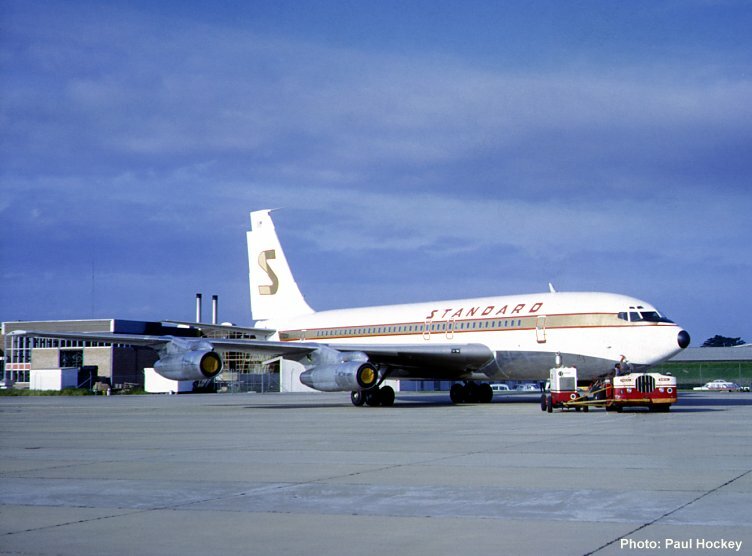 The former VH-EBB at Sydney in May 1967 prior to delivery to Standard Airways as N790SA. At the time, the aircraft was undergoing a compass swing. During this procedure, a Hobart Bros. 90 KVA ground power unit was connected to the Douglas Tugmaster with an outrigger frame. This setup was employed to power the aircraft during compass swings. For this purpose, a large diameter compass rose was painted on the tarmac outside the 1960s Cargo Terminal, and the aircraft towed around, pausing at the cardinal points. At each point, a reading was taken on the ship's compass and the aircraft was then moved to the next point. From this activity, a compass correction card was promulgated for display in the cockpit.